This is a brand new, never-before-opened 4 ft 8-lamp fluorescent grow light. Plug in and go with this beautiful light. Perfect for indoor gardens, green houses, almost anywhere. Outlet on fixture - Power up to 3 fixtures off one wall outlet - less clutter, more convenience. 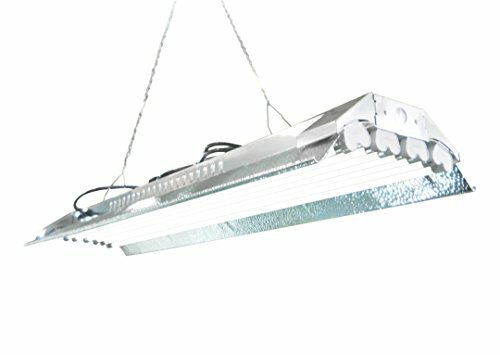 Included in Package: 4ft 8-lamp T5 light-weight grow fixture, Qty8 6500 kelvin blue-white veg bulbs, 8-foot power cable - also good for daisy chaining, UL-approved ballast already installed in fixture. 120V Input, 460W Input, L47x W13 x H4. Has Made-In-Italy AAG Stucchi lampholder with I certificate to prevent fire if tubes get loosed during operation. 30% less weight than any other brand products enables EZ installation. Control each 4 bulbs independently. Works with timers. Fixture is UL/CUL listed. Do not use with GFI/GFCI wall outlets (the outlets with the little light on them). Discrete Shipping in Brown Box.